Last year October HeART Studio approached the parents to ask if we would like our kids to take part in a project with Far East Organization. They are rebuilding the ex Paramount Hotel that was destroyed by fire on 16 July 2012 and thought it would be a great idea to hang the kids' Peranakan paintings inside some of the hotel rooms. We thought its a neat idea and agreed to let DinoBoy participate in the project. 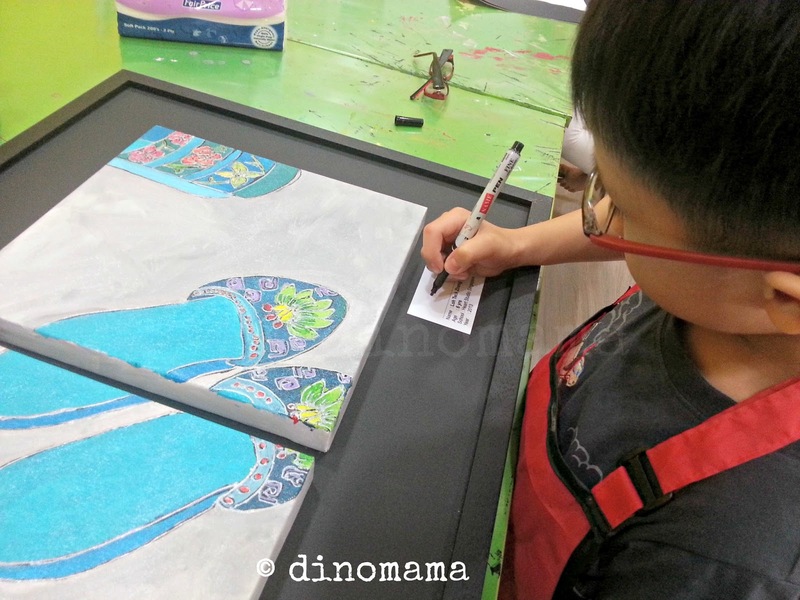 So for the following 3 months DinoBoy worked with Teacher Elma on his Peranakan painting. During the first lesson, Teacher Elma did a great job in gathering some key information about the culture and introduce it patiently to the kids. She asked each of them to choose 2 photos that they wanted to paint, after that the kids are requested to study the photos and then do a sketch. 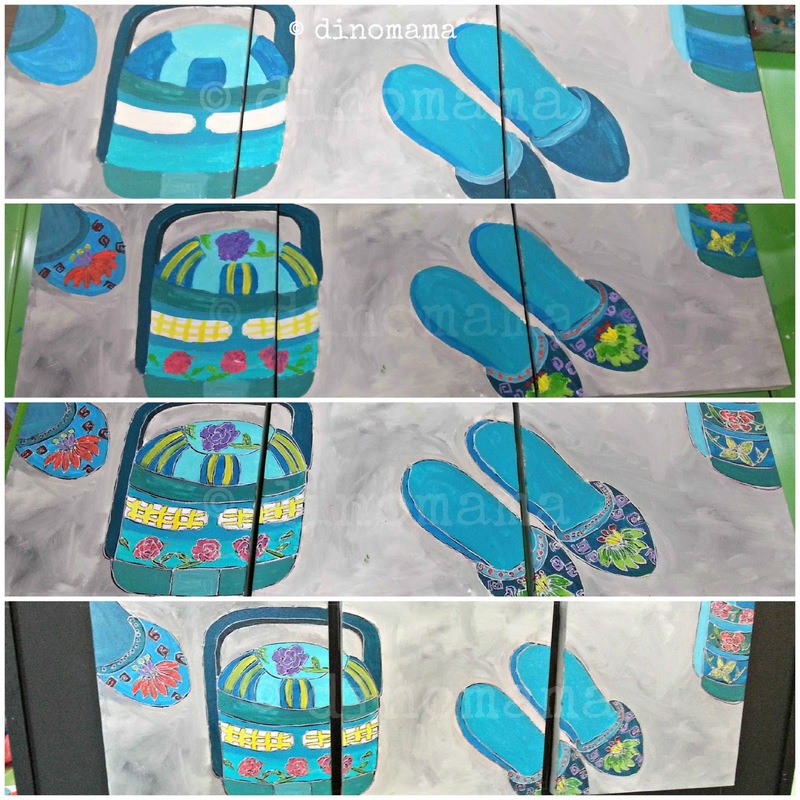 I must say I am very impressed with the way Teacher Elma teaches the kids, as you can see from DinoBoy's "Before" photos below it did not exactly look like anything Peranakan. Teacher Elma guided him to see the photos in details, the shape of the basket, the beaded pattern on the slippers etc. You can now see the new sketches was something totally different in the "After" photo, there were more details and lines, shapes and it has a 3D effect. These were done within one lesson of 1.5 hours, amazing isn't it? 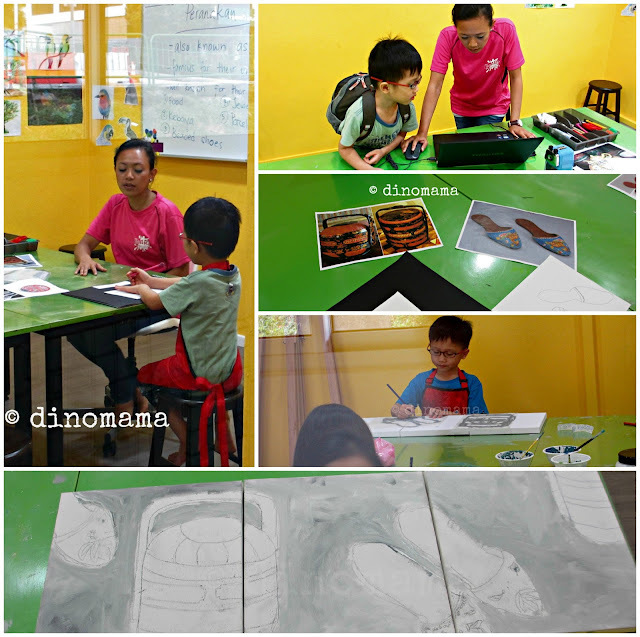 At the next lesson, DinoBoy traced the sketches onto tracing papers and then transfer them onto 3 square canvas. 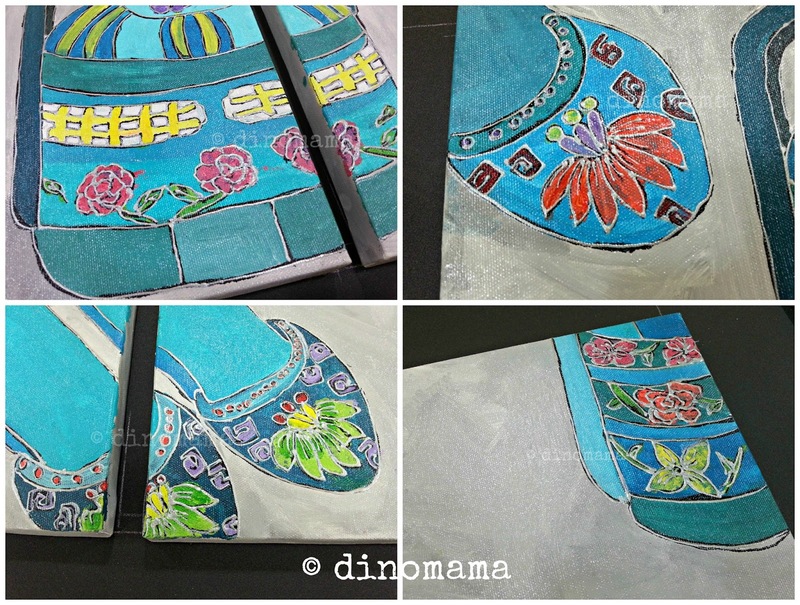 Here are the progressive photo of the canvas painting done over a few lessons, little bit of details are added slowly and painstakingly onto the canvas with Teacher Elma's guidance. It was hard work but DinoBoy did not complain a bit, he was actually enjoying it. Here, I proudly show you DinoBoy's Peranakan art work up close and in details. I am feeling so proud of him, it never crossed my mind that he will ever produce such exquisite (at least to this proud mama) work. On 3 February 2013, DinoBoy proudly writes his name on the small card and his art work is officially completed. 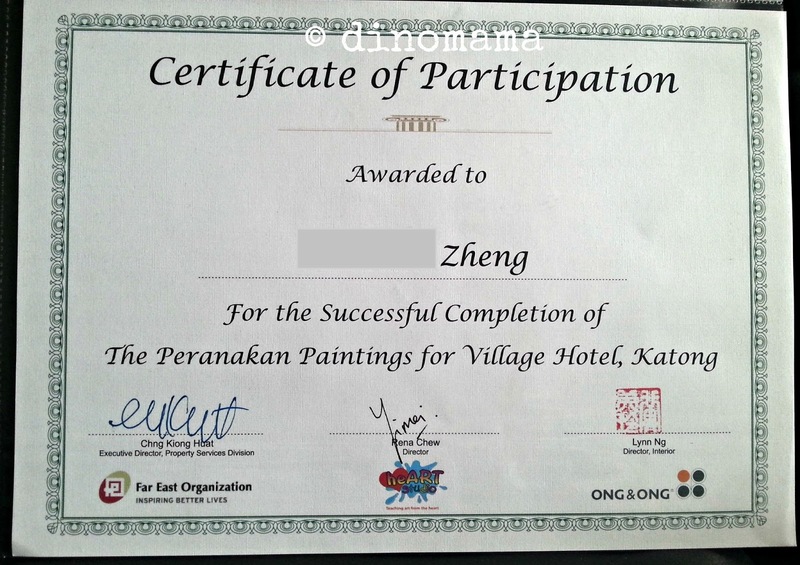 Far East Organization even gave the kids a Certificate of Participation, how cool is that! So the next time you check into Village Hotel, Katong take a look around your room and if you see a beautiful Peranakan painting in your room, please take some time to admire it. Remarks : I am in no way affiliated to the management of HeART Studio or has been compensated to write about this. 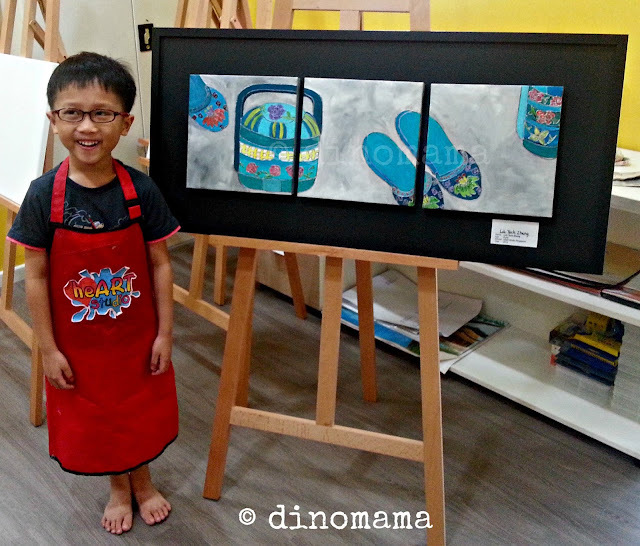 DinoBoy is currently attending art lessons in HeART Studio. All opinions are 100% based on our experience with them. The painting is exquisite! I love the details on the pair of beaded slippers! Good job Zheng. He love his painting and actually feeling shy about it coz it is his first big project! That's beautiful work. Love it! I love it too =) I hope the guests in the hotel also love it. It is indeed a meaningful project and we are glad that he was given the chance to be part of it.